Handsome, hazel-eyed deputy Sam Winters has been sober for two years. Afraid of backsliding, he lives in the mountains and keeps his distance from people. Yet he never forgot Libby, his former colleague at the sheriff’s office whose charm and cheerfulness always warmed his days. Now Libby’s back, ignoring the townspeople’s whispers (and her ex’s restraining order) while desperately trying to make Homecoming Ranch a successful event destination. She keeps causing trouble for Sam, but he finds her smile more beautiful than ever…and his touch gives her thrills she’s never felt. Could these two lost souls mend each other’s broken hearts? 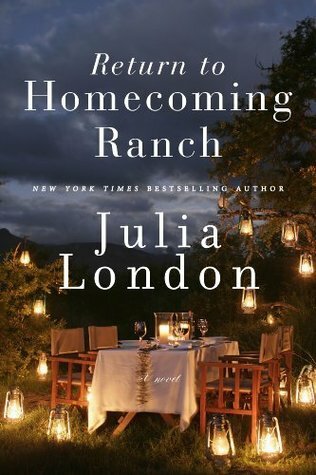 I very much enjoyed Return to Homecoming Ranch by Julia London. It is second in what will probably be a trilogy, however this book could very easily be read as a stand alone. The characters in this book are all pretty much flawed - there are no perfect heroes or heroines. Libby has had a very raw deal, suddenly been cut off from two children who she has 'mothered' for over four years. She has been used really by Ryan their father. Libby believed she was on the road to a 'happy ever after' but gets a rather cold shower of reality dumped on her. She is extremely angry, and right through out the book it is a challenge for her to master that anger and 'turn the page'. My heart went out to her, her anger was perfectly understandable. She got a raw deal. Sam who has pretty much always loved Libby has issues of his own. As the local deputy he must enforce the restraint order placed on Libby, and while he falls for her all over again, he is struggling with remaining 'drink free' day by day. When Libby goes what he considers one step too far, his trust and need to keep everything 'calm' is severely tested. At points throughout the book we are given Leo's point of view. Leo has motor neuron disease, and he provides another perspective. While his disease is getting worse, he is able to focus on the little joys in life that matter. The women and Libby have as their goal to fundraise enough money to buy Leo a special van that will take him to a match he wants to be at. This was an emotional, thought provoking book. I loved how Libby never gave up, and eventually came up with a great idea for the ranch - to make it viable and to be involved in a very important issue. I look forward to then next book, I am sure this will be the third sister - Emma's story. It will be very interesting to see where Julia London takes that story. I never read this author, but this book sounds good to me. The two main characters seem destined to be together, but in a realistic way. Thanks for sharing this new to me title. I haven't read a lot by Julia London, I know she writes a lot of historical but as I prefer contemporary I have been trying out the books she writes in that genre.